On a clear blue sky Sunday, I made my way out to the H St. neighborhood to visit The Chic Shack, a contemporary and vintage consignment boutique. The boutique hosted an intimate brunch for local bloggers to network, talk about fashion, and, of course, scour the racks filled with seasonal clothing items. What I loved the most about this space were the eye catching shoes and accessories that occupied every nook and corner. Seriously. Didn't matter where my eyes roamed, it was bound to come in contact with a pair of designer sky high heels or an over-the-top statement necklace or a one of a kind vintage purse. Domencia, the owner and host of the event, made sure that us bloggers had a chance to see the store in its entirety. 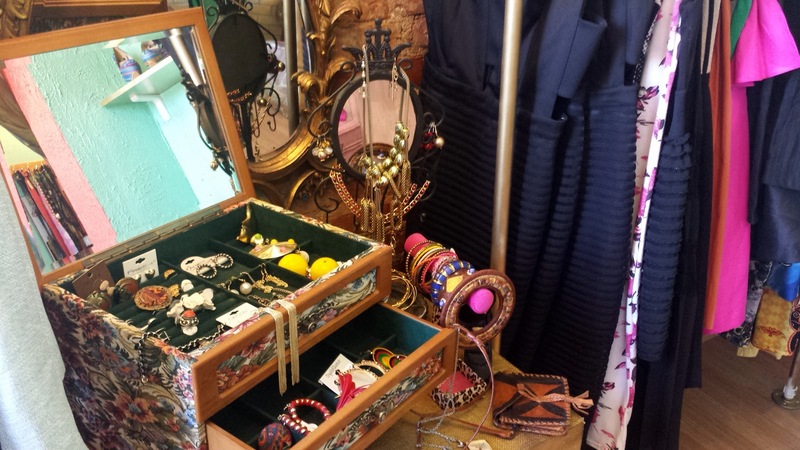 One room is stocked with contemporary pieces while the other room is where one can find the vintage clothing. The fitting room is located there, as well. Sizes range from S-XL. While the store has been open for a short two years, The Chic Shack will soon be on the move. The hope for the boutique is to occupy a much bigger space towards the end of the year. Until then, check out the boutique. Or at the very least, say hi to Domenicia. This young entrepreneur was a treat - always smiling, always helpful, and always cracking a joke. But, really, you're bound to leave with at least one item.